Bridget is a legend. Not only is she full of life, love, positivity, and charisma, but also she is the adventurer I believe nearly all of us wish we could be! She does it purely for the love of adventure, for fun, and to enjoy this beautiful world. Bridget holds two Versaclimber Guinness World Records; one of which was climbing the height of Everest (29,028 ft) with a team of 8 in two hours, 45 minutes and 53 seconds. She took home Bronze medal in the National Indoor Rowing Championships. She cycled 3,000 km, mostly off-road, around New Zealand while racking up quite a few miles of running on the way. She finished Magavalanche without killing herself and sustained only minor damage to herself and her bike! She earned 7th place in her age group in the World Master Mountain Running Champs. Plus, she has enjoyed thousands and thousands of fantastic miles exploring without a Strava mile in sight! “Before I start I need to point out that I’m not a proper runner any more, I’m what I would call an adventure runner. These days the adventure comes first! If I see a cave which needs exploring, a tree that needs climbing or a summit that needs to be conquered just to see what’s on the other side then it has to be done. I race less and less because it’s really hard to fight the inclination to stop and play. I think I was 50 when I started running. I read an article about local ultra runner/Deca Ironman Bob Brown who ran the race across America. After thinking (for a split second) that I too could do that, I hadn’t even started running than other than around a hockey pitch and tennis court, I realised that might be a little over-ambitious, so for a few more seconds thought JOGLE but very quickly settled for the length of Cornwall as a fundraiser. I phoned a run coach friend of mine and asked if he could help… I started training and the route was set for 4 months time to run 5 marathons in 5 days ziggling around Cornwall. This multi-day marathon was quite unusual back then and I even had a little article in Runners world. I achieved my goal and raised £12,000 for the local Derriton Hospital Prostate Unit. I was disappointed with the money as over £20,000 had been promised but the Boscastle flood occurred a few days before I started and a lot of the promised donations went to the flood appeal instead. My first multi-day was certainly more of an adventure than I had ever imagined but that’s what makes life exciting! Getting into some serious mountains here! It depends on elevation but I guess a 20ish mile mountain race would suit me best these days. I’m a great believer in taking yourself out of your comfort zone and I mean really out, I try and do this once a year, it just shakes things up. Not necessarily just with running but mountain biking, ridge scrambling or whatever, it’s all about conquering fears/challenges to make you I believe a stronger person. I’m 66 in a minute and Roger is 73 but age is immaterial, we are never going to stop because we are told we are too old so should stop! I yearn to be out exploring, to find a ruin or cave or even an old mine shaft on the moors, it’s all about the vencha and running is part of this. Up in the Scottish hills striding back into Kinlochleven! Do you run on the road? Haha…Road? Never, or wide forest trails we lose the will to live! Always prefer technical single track, particularly love the downs but not so good on the ups! Who in there right mind…would avoid a puddle? Wherever there is space, nature, and peace… My favourite local places would be Bodmin Moor, Dartmoor and sometimes the coast path all relatively close to me. Further a field I love mountains especially when we find we are the only ones on top. In second place, I would have to say Marathon des Sables; the organisation is phenomenal, I would do it every year if I could afford it. Without doubt my best event would be Ultra Marathon Caballo Blanco, there is nothing to match this as far as we’ve discovered. This event attracts people with the same heart and ethos the actual race seems almost irrelevant, it’s all about the Indians, the local Mexicans and the wonderful family of American and a few international ultra runners all pulled together because of Micah True. If you’ve read Born to Run it’s as if you’ve been transported into the book but volume two which has never even been written. I can’t find the words to describe this event. I realise both these are a big financial commitment so I would also like to add Fell Races, which are so real, love them, last year we did fell races in England, Ireland and Wales, I hadn’t realised that all 3 were championship events, I was actually the first female in the Irish one (only because there were 3 entered, 1 no-show, 1 retired and me….it was a tough one)! The ethos in these races is just amazing. It has been Scott Kinabalu super track but I’m now in trouble as the later models just don’t suit me. The original ones were amazing on rocks. I need to find some replacements quickly! Definitely no GPS/Watch or music! Why would you want music when you can hear skylarks, swallows and cuckoos? I love running on my own but also with my partner Roger, I also love running with a small group of friends, much younger than myself but we all share the same ethos. Post run is always a good cuppa out of a thermos and a chunk of homemade cake… always the best. Post-race is a problem I can only stomach milk, ice cream and custard. Bridget and Barefoot Ted – two legends! 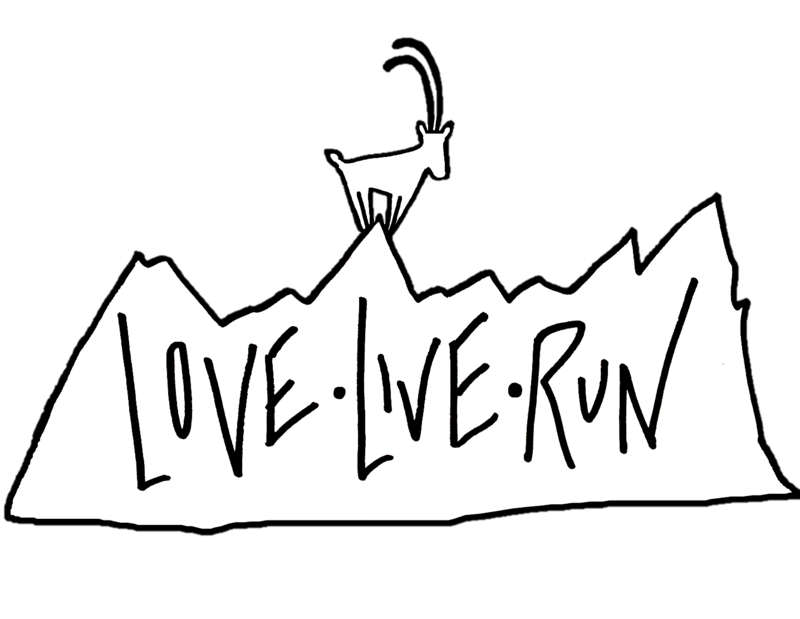 Love – Live – Run and get out and hit the trails! Thanks. Great article about a great and lovely lady.